Late deer season can be some of the best hunting. Frigid temperatures without proper clothing and equipment can keep even the most dedicated hunter at home. Tackle the cold, fill your tags and take the buck of your dreams this season! Head- Keep your head and ears warm with a hat, beanie or face mask to block the wind. Neck- Many hunters forget this, but offering insulation on your neck can keep the rest of the body warm. Wear a neck gaiter and you’ll be surprised what a difference it makes. Body- Start your layers with a thin moisture wicking layer of clothing. Then add clothing made of windproof, waterproof and breathable materials. Insulate your chest with a down vest, bibs or a quiet jacket. Hands- They always seem to get cold first! For bow hunting make sure you have a great pair of thin moisture wicking gloves. For rifle hunting wear insulated shooting gloves or warm quiet gloves you can remove before taking your shot. If you’ve tried these options and your still cold, invest in a hand muff so you can easily remove your hands and keep them warm before your shot. Feet- Wear two pairs of socks. The first pair should be made of moisture wicking material and the second pair should be a thick wool sock. Slip on insulated waterproof boots and your ready to hit the cold night air! The last thing you want to do in freezing temperatures is sweat. 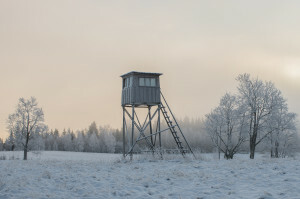 Give yourself plenty of time to walk to your deer stand and avoid breaking a sweat. You may need to remove a layer on your way to the deer stand or pack your jacket and take it with you. Yes, you read that right. Move! Don’t scare the deer away, but try flexing your muscles while sitting and slowly move your hands and feet to increase blood flow. This will also help keep you warm. There is no shame in running a heater in your deer stand. Safely use propane heaters and make sure they are sturdy to avoid tipping over. Take these tips with you on your next hunting trip to stay warm. Share your hunting pictures with us and come by for all your hunting needs! Good luck this season and stay warm! This entry was posted on Tuesday, October 20th, 2015 at 3:27 pm	and is filed under News & Updates, Wildlife, Deer. You can follow any responses to this entry through the RSS 2.0 feed. Both comments and pings are currently closed.